The movie rental giant says Steve Jobs’ software is too restrictive, and its online movie rival is too geeky for regular users. Part one of our interview with Blockbuster’s digital chief. Tomorrow we switch our focus to the company’s financial future and new Droid X app. Will Blockbuster’s aggressive digital strategy be enough to save the crumbling video-rental giant from bankruptcy? 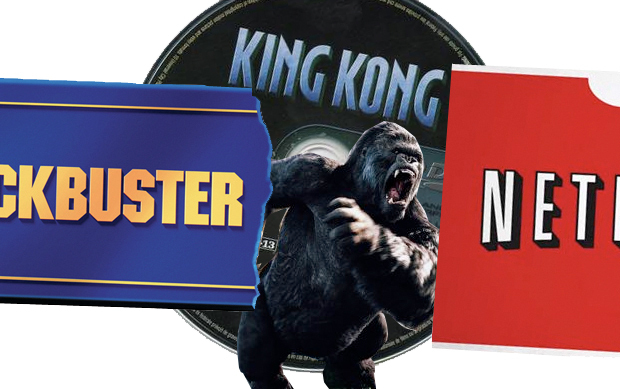 Blockbuster CEO Jim Keyes told me recently that figuring out how to get movies from his “Nintendo machine to the screen” makes his “head hurt to think about.” Is he less optimistic about the company’s digital strategy? Jim is fully supportive. If there’s a difference you hear between us, it’s more the vocabulary we use than the concepts we articulate. Our job is to simplify the process [of watching movies via the Nintendo Wii] so it’s like using a DVD. You shouldn’t have to learn all this crazy stuff. Why does it make sense to go to your den, boot up your computer, then log into Netflix to program old movies into a separate queue before you can wander back to press play? Does Blockbuster have plans to come to the Nintendo Wii or other consoles? I would love to be on game consoles, but the challenge is that Sony and Microsoft consider themselves movie retailers, and haven’t made the PS3 and Xbox platforms available to third parties yet. They don’t care about Netflix with its five- to seven-year-old content. But we’ll get there eventually, even without their cooperation. Does Blockbuster have plans to be on the Mac? We have plans to bring Blockbuster On Demand’s streaming and download services to the Mac later this year. Does Blockbuster have plans to be on the iPhone or iPad? Again, my gosh, I would love to bring our products to those devices in a way that makes sense to our consumers. But Apple reserves the right to block anything that conflicts with iTunes. Do you have the iPad? What do you think of Netflix’s app and digital strategy? We have devices that we share among the digital team. I have an iPad, and a Netflix and GameFly subscription. What do I like? I really appreciate that Netflix is helping consumers understand that movies can be delivered through the Internet. What I don’t like about Netflix is that they’ve diminished the user experience and movie quality. They’re doing a minimum to get that HD stamp, but they’ve done all the tech-wizardry in the background to make the file smaller and quality lower. I’m actually surprised by how little some of our competitors get away with doing. Netflix told their consumers: Sorry, we didn’t ask you, but we’re actually not going to let you rent movies from two-thirds of the studios for a month. Hope you don’t mind. Redbox is only a buck, but you have to wait a long time. I just think that’s wrong. I look at Apple–and I love Apple for a lot of reasons–but I find it unconscionable that Apple forces you to buy their hardware and their content from a single provider in order for it to work. That’s not the way the world should work. We’ve said: Buy movies from us, play them anywhere. We think that’s the right model. But doesn’t Blockbuster have the same problem? The fact is, I can’t play a movie on my Nintendo, or my Xbox, or my PS3, or my iPad and iPhone. I can’t watch on my Mac. To play, I need a Samsung Blu-ray player or a Droid. Isn’t that the same problem? The difference is strategy versus timing. Eventually, we’re going to be pretty much everywhere. That’s our strategic intent, and it’s fundamentally inconsistent with Apple. You say it’s the company’s intention to be everywhere, but if Blockbuster conflicts with Apple, Sony, and Microsoft, among others, isn’t the company’s business model, unlike Netflix’s, interfering with its digital strategy’s success? I never said Sony–I said PS3. Companies speak with many voices. Look, it’s not that our business model is challenged–again, I’m amazed at how little these companies do for their consumers and how for-granted they take their consumer relationships. Again, couldn’t Blockbuster customers say the same thing? I mean, I can’t even use Blockbuster on a Mac. You’ll be able to use Blockbuster on a Mac. What you may not be able to do is have a movie-download app on your iPad. Look, we could’ve just thrown something out there in the app store–that would’ve been a hell of a lot faster, but it’s not the right consumer experience. We want to tune every application for each device it’s on. So with our new Droid app, we optimized it for that experience. That’s the Blockbuster brand promise. We’ve been hesitant to go with disc-based or app-based solutions because you don’t get that optimization between the hardware and software. Let’s put it this way: Would you rather have a streaming app on an iPad? Or would you rather have an embedded application on the Droid? That was an easy one for us.